Director Buz Davis said something to me at the afterparty along the lines of “And they said we couldn’t stage this thing in the basement!” I’m not sure who actually said it, though I’m sure lots of people thought it. 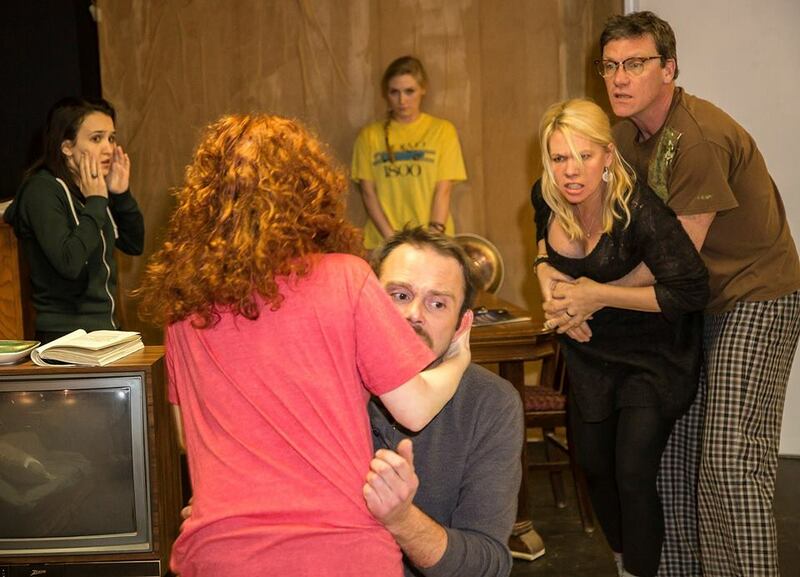 After all, AUGUST: OSAGE COUNTY traditionally uses a three-story set. It features a cast of thirteen. In a space that only seats about 50, this sure does seem challenging. Perhaps even a little foolish. But with a cast this strong, a story this compelling, and the kind of “us-against-them” camaraderie that the Clifton Players and Untethered Theatre have, it’s a rousing success. AUGUST: OSAGE COUNTY is the story of the Weston family. “Violet,” (played by Dale Hodges), has mouth cancer. That hasn’t stopped her from being one of the most sharp-tongued devils to grace the stage. Her husband, “Beverly,” (played by director Davis) has gone missing and the family is reuniting in their sweltering home on the Oklahoma plains. The dysfunctional tension is palpable. All the regular players are here, with some extras, too. Prior to Beverly’s disappearance, he hired “Johnna” (a beautifully restrained Leah Strasser), a Cheyenne girl, to look after his wife. There’s Violet’s sister, “Mattie Fae” (Christine Dye), her husband, “Charlie” (Bob Allen), their son, “Little Charlie” (Carter Bratton), Weston daughters “Ivy” (MaryKate Moran), “Karen” (Mindy Heithaus), and “Barbara” (Carol Brammer). Barb is married to “Bill” (Kevin Crowley) and they have a daughter named “Jean” (Sarah White). Karen has a skeezy fiancée, “Steve” (Nathan Neorr), and finally, there’s an appearance by the local Sherriff (Reggie Willis). This is quite a crew. There’s not a bad performance in this cast, which is saying a lot given the size of it. Hodges is one of the cities most treasured actresses and she doesn’t disappoint as the feisty, mean-spirited pill-popping matriarch. There are some moments of pure brilliance from her, especially when she’s high as a kite. Her gleeful, almost evil manipulation is despicable, yet there’s something about the way Hodges plays her that allows the audience to empathize at the same time. There’s no wonder she’s such an audience favorite. Brammer, who I remember several months ago told me she was a little intimidated by standing toe to toe with Hodges, holds her own. There are some amazing moments from her, especially when she’s completely relaxed and naturally inhabiting the deep-rooted anger of character. Crowley, who like all the men in this family, has grown tired of the Weston-way and has found a younger woman. His character, used to dealing with the mean-streak, is weary but remains calm and collected. In the hands of a less skilled actor, this could be boring. But Crowley gets it and is just delightfully sturdy. So is Bob Allen, who’s “Charlie” is so deeply in love with his vindictive wife that he tolerates her inappropriate outbursts and passive-aggressive comments – especially towards their son – most of the time. Allen is such a pro; when the time comes for him to lay down the law he does it with measured precision – not over doing it – but giving the audience just enough to know that he hasn’t completely been emasculated by his wife. It’s an applause worthy monologue. Dye, quite capable of stealing the show, holds back just enough not to. There’s very few actresses in town I enjoy more than her and I just can’t ever say enough wonderful things about the way she brings these characters to life. There’s a fierceness to her performance that gives the others a run for their money. Kudos to Davis for getting his actors to channel their immense talent in such an ensemble-like way. Strasser shows her versatility again here. This potentially one-dimensional minor character is in very good hands with her. Heithaus, who often hasn’t been given enough to do lately, makes the most of her moments here as usual. Moran, wonderful at playing underdogs, gives us someone to root for with “Ivy” with some really nice understated work in a few of her scenes. Neorr, who’s energy is very big, doesn’t go too far and instead foreshadows just enough as to what he’s all about. Sarah White, a newcomer to this basement playground, is just wonderful. She brings a youthfulness necessary for the character but also has maturity that makes the whole character arc believable. Bratton, often playing unlikable, dark, or brooding characters shows his sweeter side with this horse-whipped man-child. Both Davis and Willis play their scenes with restraint and charm. Yes, I liked it a lot. There are some problems with the space; your best seat is right in front of the bar as this gives you an unobstructed view of the whole “stage.” Get there early so you can have your pick. Even here, you’ll still have some actors’ backs to deal with, but that’s unavoidable. At least you won’t get a crooked neck from craning to see the attic or the office areas. There were some opening night line flubs and it is a 3 hour, 15 minute (at least) marathon of a show. The two intermissions were welcomed and they do serve wine at the bar (or in my case, Coca-cola). Even with this lengthy run-time, I didn’t feel compelled to look at my watch and I was engaged in the unraveling of this hanging-by-a-thread-already family throughout. This show will very likely sell out each performance so get your tickets now. AUGUST: OSAGE COUNTY shines a window on one particular family, with very specific dysfunction – but I bet you’ll find at least one character, one detail in the story, or one moment that you will call to mind something deeply personal. Or maybe several. Regardless, you will leave feeling satisfied that you saw something special. 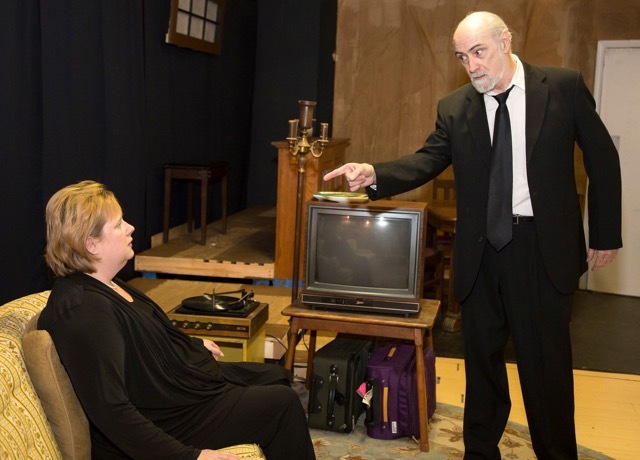 Tracy Lett’s AUGUST: OSAGE COUNTY runs through March 14th at the Clifton Performance Theatre on Ludlow Avenue in Clifton. Tickets are only $25 and are available here. There are a couple of Monday night “industry-friendly” performances so there’s no excuse not to pay a visit to the most unique theatre experience in town.